what’s happened, what to expect and what this means for each one of us. On 28 April the State Security Service of Ukraine (SBU) issued a statement that they had uncovered a group of “leftist radicals” who were apparently preparing a provocation on 1 May with the aim of “destabilising the situation in the region”. 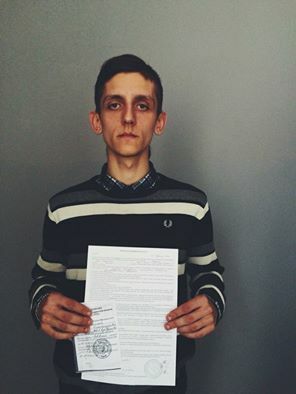 Oleh Kordiak, resident of Lviv and an activist of the anarchist organisation Black Dawn was detained. During the search the security service officers confiscated from him some leaflets urging people to join the May Day demonstration. For having these leaflets Kordiak is threatened with ten years’ imprisonment in a strict regime camp. At the same time as Oleh was detained the SBU “uncovered” another organisation of “anti-fascist Stalinists”, the very existence of which is doubted. In an effort to understand what is happening here Politychna Krytyka turned to Lviv journalist Maksym Osadchuk, lawyer Vitali Dudin and Yevgeniya Kovalenko, activist of Black Dawn. “Oleh Kordiak is an activist of the anarchist movement Black Dawn, formed in Lviv a few years ago. They present themselves as classical anarchists. There are lots of young people, some of whom used to belong to the Autonomous Resistance organisation, but then set up Black Dawn. As for the other organisation which, as it were, professes Stalinism, well no-one in Lviv has heard of them. Its more than likely they have been planted as actors that the SBU is using in order to compromise Oleh’s reputation in the eyes of the community. Oleh’s detention on the charge of distributing leaflets calling on people to come out on May Day sets a precedent which promises no good for anybody in this country. In fact they are trying to pin on him ten years in a strict regime labour camp (under Article 109 of the Ukrainian Criminal Code: “calls to bring down the constitutional order and seize state power”) solely on the basis of his active civic position. This plainly resembles the police dictatorship in the Russian Federation with which, it would appear, we are at war at this very moment. If the men of power (sylovyky) take Oleh’s case all the way to a conviction in court, then anybody in this country, regardless of their political views, can be summarily put behind bars as soon as the authorities request it. With regards to the reason for the detention there is one explanation afoot: the sylovyky are trying out different kinds of “provocateurs” on the occasion of May Day, which in Lviv never takes place peacefully. That’s why they took the anarchist Kordiak. I think that this was their way of preventing the demonstration from going ahead and, additionally, to intimidate all the other independent activists. Moreover, the march in honour of the SS Division Galicia went ahead peacefully in Lvi on Thursday, which testifies to the prejudice of the authorities precisely against leftists. “These are very serious charges. I guess the lads should start thinking about emigrating or start hoping that someone will act on their appeal and it will lead to a change in government. But seriously, the government risks making itself a laughing stock and discrediting Ukraine. These repressions are being carried out within the context of the law and are going to get an unequivocal reaction from the European Union. It turns out that Ukraine has decided to adopt best practice from abroad. I have in mind the politics of witch hunts in the 1950s….. Article 109 of the Ukrainian Criminal Code deals with responsibility for circulating materials that call for a change of government by force. There was no such circulation carried out here and it is not at all evident whether the slogans of Black Dawn can even be understood as agitation to carry out some specific act. Unfortunately, we already have cases in Ukraine where courts have convicted people and imprisoned them for circulating information on the Internet. In those cases the people convicted expressed sympathy with the ultra-right movement or for separatism. It was to the advantage of the state authorities that some of those internet postings contained calls to concrete action (to kill the president or to fight against the Ukrainian army). In this case, however, we have leaflets that were not distributed. The charges laid can easily be rebutted. To prove guilt one has to establish a motive, intention and a danger to society from the action….. The SBU has no facts on which to base criminal charges. Therefore, these actions by the law enforcement authorities exceed their official authority and competence, and they have been carried out with the intent to persecute adherents to a particular ideology. I am not even mentioning here the violations of due process which occurred during the search…. As for the characterisation of the (May Day) meeting as a “provocative” act, I am reminded of an anecdote about Russia where a peaceful gathering is “a constitutional right punishable under criminal law”. I have to stress that if someone really was putting up posters of Stalin then this in itself would not be a criminal act. One good thing: this new “anticommunist” Article of the Criminal Code has turned out to be so flawed that the SBU have not even tried to apply it in this case. In similar circumstances one could arrest any protestor: all s/he has to do is say “Down with the authorities” and s/he starts to figure in a criminal investigation. But this contravenes basic human rights and democratic standards. The actions of the SBU look especially idiotic in light of the recent decision of the European Court of Human Rights (ECHR). The Court ruled that the Russian Federation was guilty of violating the right to freedom of expression (Article 10 of the European Convention in Defense of Human Rights and Fundamental Freedoms) and ordered it to pay out 35,000 Euros to five Russian citizens. That was the decision made by the ECHR in the case of Novikova and others versus Russia, published on 26 April: ”Bearing in mind that all the pickets were peaceful, the authorities should have demonstrated a certain degree of tolerance towards the demonstrators” – it is stated in the ruling of the ECHR. The Court also drew attention to the fact that “the situation did not constitute any threat to public safety, did not impede free movement, and so there were no compelling reasons for arrest”. The ECHR defined the reaction of the Russian police to the picketing as “disproportionate”. It recognised unanimously that the rights of Russians in this case were violated. So, can we imagine what sort of reception this SBU case in Lviv is going to get? The United Nations General Assembly in its December 1948 General Declaration of Human Rights stated in its preamble that “the creation of such a world in which people will have freedom of expression and belief and will be free from fear and compulsion is declared the highest goal of humanity”. It goes on to say that people have the right “to rise up against tyranny and repression”. By their actions the authorities are daily creating the conditions under an uprising will look like a reaction that is legitimate from the point of view of the fundamental Acts of the United Nations. Unless there is pressure mounted by the SBU then not only the European Court of Human Rights, but also the Lviv District Court will declare the charges unlawful. One should assess the conduct of the SBU as an act of political struggle that has nothing at all to do with jurisprudence. They want to set a precedent of pressure, so that their actions are then approved by the courts or by society. After this any mention of leftist ideas will be met with fear. Therefore the objective of this prophylactic work is to spread fear. The SBU is fulfilling the function of a political police. The work of the Service is aimed against the foundations of democracy and manifests itself in its control over freedom of the word and peaceful assembly. At the same time the activities of ultra-rightists can take place without any hindrance, even though one might hear from them calls to violate human rights. It is pointless to claim that this institution is politically neutral. On the contrary, representatives of the SBU even expressed their support for the march in honour of the SS Galicia Division, which points to their direct involvement. Thus the powers that be are carrying on a discussion with the aid of notifications to the oblast (regional) administration of the SBU. This is not the initiative of some separate units if such “self-activity” is popping up in different regions. A “dictatorial law” was promulgated in Yanukovych’s time which introduced responsibility for preparing and circulating “extremist materials”. Those in power today are using Article 109 with the same motive in mind, even though it is not altogether lawful. In this way they carry out repressions without adhering to the law. In order that they do adhere to it they need to adopt an even more absurd and repressive law. After they do so our country will lose even he formal trappings of democracy. The repressions against activists of Black Dawn signal the end of the post-Maidan period when people could protest freely and the authorities, frightened by the Maidan, had to accept the fact of dissent. Now we see, when the country is being engulfed by class contradictions, when people’s situation is rapidly deteriorating, the state has started to repress social activists. Black Dawn showed itself as one of the most active participants in this field; they came out to protests with the miners of Chervonohrad, they organised a lot of social actions themselves, and so on. All these accusations with which they are trying to incriminate Oleh Kordiak are sewn together in thin white thread: Black Dawn has never had any links with separatist organisations and its activists have been more than critically opposed to the regimes of the DNR and LNR (Donetsk and Luhansk People’s Republics). As well there is no basis to claim that Black Dawn has any relationship to the Stalinists – on the contrary, like other anarchists the Lviv libertarians frequently criticise the totalitarian character of Bolshevism. The libertarian movement in Ukraine is currently undergoing a crisis, there is a generational change underway. However, the situation with repressions in the country, in which people only recently died opposing the dictatorial pretensions of those in power – including the anarchist Serhii Kemsky who was killed on the Maidan – – demands that all anarchists mobilise for even greater action. Everyone understands perfectly that today the repressions landed on the Lviv anarchists, and tomorrow the SBU will come for anyone they want. On the eve of this Day of Solidarity of working people it is extremely important to expose at the very least these actions of the state system against the anarchists, who defend the rights of working people. We must show that for us solidarity is not an empty word. Ilya Ponomarev – the only member of the State Duma, who voted against the annexation of the Crimea, recorded a video message in support of Oleg Kordiak. Next WHY ARE OLEG SENTSOV AND ALEXANDER KOLCHENKO IMPRISONED?